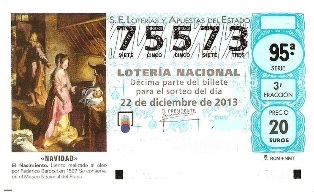 Tomorrow morning, the Christmas season in Spain begins in earnest with the drawing for El Gordo, the Christmas lottery. It will take about three hours to award the jackpot of €2.5, or US$3 billion, which is split into more than 15,000 prizes. I bought my ticket at my newspaper kiosk. This year, numbers that end in 13 are considered lucky since the year is 2013. However, I graduated from high school in 1973, so that might be lucky, too. Last year, I won €20, which is what the ticket cost. This year, maybe I’ll break even again. Or maybe I’ll win €400,000. I’ll let you know.